Kevin MacDonald, the California State University, Long Beach, psychology professor who wrote an anti-Semitic trilogy explaining why he thinks Jews are bad for white societies, has been removed from instructing certain classes. Gerry Riposa, dean of the College of Liberal Arts, told Hatewatch that MacDonald would no longer be teaching lower-level courses, including a required course for psych majors specializing in child development. 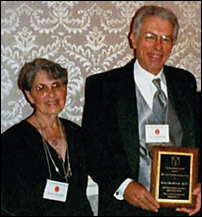 MacDonald, at right, received an award and $10,000 for his work on the Jews from The Occidental Quarterly, a white supremacist journal. He was accompanied at the 2004 ceremony by Virginia Abernethy, a self-described “white separatist” and official of the racist Council of Conservative Citizens. University sources say complaints about MacDonald’s anti-Semitism and racism following the April publication of the Intelligence Report’s exposé, “Promoting Hate,” spurred the change.